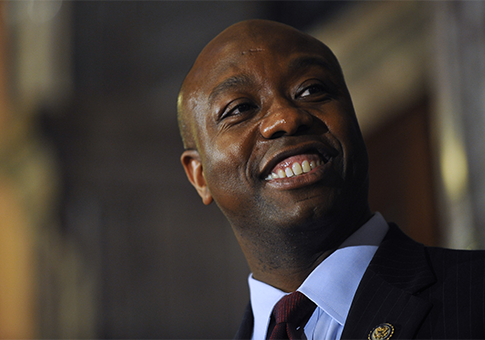 South Carolina Sen. Tim Scott (R.) slammed liberal proposals to use the nuclear option to push President Barack Obama’s controversial labor board nominees through Senate confirmation. "The nuke option keeps coming back to the table," Scott said on a Tuesday afternoon conference call. "The Democrats keep threatening us with the nuclear option…and you can’t keep threatening the entire body." Some Democrats fear that Republicans could block Obama’s appointees for secretary of labor and the National Labor Relations Board after Scott and his GOP colleagues on the Senate Health, Education, Labor, and Pensions Committee (HELP) grilled the nominees during a hearing last week. "We will not get 60 votes…[so] I think we should change the rules and take a majority vote to not only see that these people are seated so that they can do their job but that other nominees who have been clearly obstructed also have a chance to do their job," he said to committee Republicans. "You guys just happen to be in the way right now… don't take it personally." Sen. Lamar Alexander (R., Tenn.), ranking Republican on the committee, rebuked Sanders’ accusations during the hearing, pointing out, "President Obama's cabinet nominations have been treated more rapidly than the last three presidents in their second term." HELP Republicans twice delayed Tom Perez’s nomination to head the Department of Labor, citing his failure to cooperate with a House Oversight and Government Reform Committee investigation into allegations that he used a private email account to conduct government business on more than 1,000 occasions—a tactic associated with dodging disclosure laws. Perez is also being investigated for an alleged quid pro quo that cost taxpayers up to $200 million. Perez passed through committee 12-10 on Thursday morning; no Republicans supported the nomination. Obama’s nominees to the National Labor Relations Board face a similar uphill climb. Two different federal appeals courts have ruled that the recess appointments of Democrats Sharon Block and Richard Griffin while the Senate was still in session in 2012 were unconstitutional. The pair ignored the rulings and has issued more than 200 judgments in labor disputes since the D.C. Court of Appeals declared their authority unconstitutional in January. Obama chose to re-nominate them, as well as Chairman Mark Gaston Pearce, to the board, but some Republicans vowed to vote against the nominees for defying the court. Scott said the GOP had the right to raise questions about the nominees given their history of ethical and legal concerns. "We have very legitimate concerns that need to be heard through the complete [confirmation] process," he said. Senate Majority Leader Harry Reid (D., Nev.) has yet to schedule Perez’s floor vote, which is not expected to be considered by the full Senate until mid-June. HELP Committee Chairman Sen. Tom Harkin (D., Iowa) has yet to schedule a committee vote on the NLRB nominations. "My hope is we find a way to stop the nominations," Scott said. This entry was posted in National Security and tagged Congress, Federal Bureaucracy, Obama Administration, Tim Scott, Tom Harkin. Bookmark the permalink.